Palate: Long and elegant. An explosion of subtle flavors such as light tobacco, coffee and cocoa and some light spices. Then, releases a rich and harmonious finale. An amazing flexibility to the palate. The François Peyrot XO Cognac is a winning combination. Firstly, you're getting a truly eco-friendly Cognac that has been produced with absolutely no chemical involvement whatsoever - and that includes the preparation of the land, the vines, and everything else that goes into producing this fine Cognac. 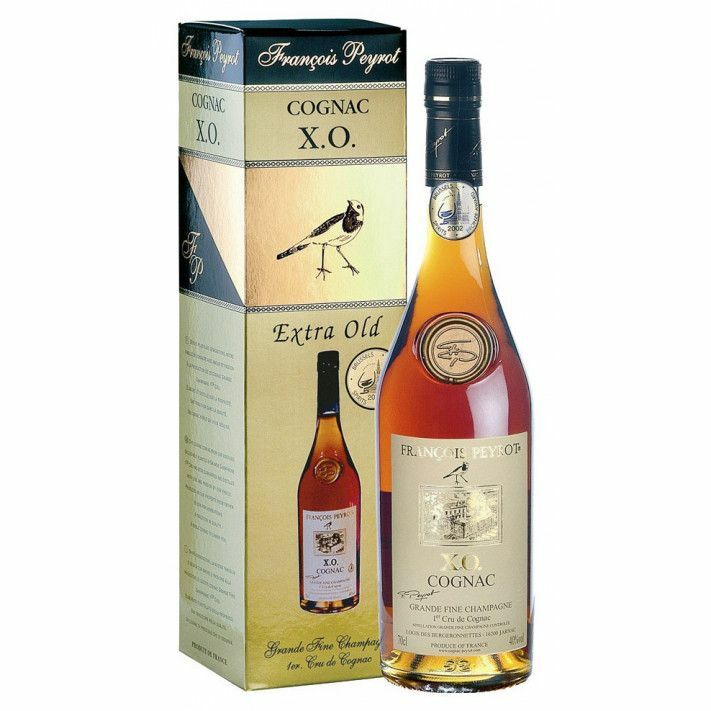 Of course, you're also getting a wonderfully aged tipple - an XO Cognac, or "Extra Old" that truly deserves its place in any connoisseur's cabinet. Aged for approximately 25 years, it is a pure Grande Champagne blend. What's more, it is produced only from eaux-de-vie grown in the house's own premier cru vineyard. It may also be classified as a ‘25 Year Old X.O’. The Peyrot XO offers exceptional value for money for such a quality of Cognac that has been aged for a quarter of a century. This Cognac arrives in a stylish and slim bottle with the house crest impressed into the neck. The François Peyrot XO is optimally served neat, at room temperature, but more specifically between around 16 to 18 degrees Celsius in a glass. The François Peyrot XO attracts a sizeable and loyal fan base, due to its unrivalled value for money, regardless of the age and high quality. This Cognac is sure to become a dependable member of your drinks cabinet for this reason alone. Read more about the best cheap cognacs for under 60 dollars right here. 2013 Médaille Grande d’Or, Taiwan. It has certainly had its fair share of appraisal. Experiencing a François Peyrot is a guarantee of the finest "Les Bergeronnettes" grape variety from the notable Grande Champagne region. The unique nature of the clay and limestone soil in this region of "Premier Cru" classification has been formed over hundreds of thousands of years, and means that it is of the most unrivalled quality. The very complex geological makeup is a key element to achieving optimum quality of Cognac. The distillation process is somewhat of an art form, and takes place in two stages. The natural distillation is one which combines a very particular set of flavors, and then the expertise of the Cognac Master takes over. This very set of connaissances is one that is passed down from generation to generation. Its bouquet is one that is certain to surprise you, and the traditional oak barrel process is one of speciality. The Peyrot estate is located in the French town of Jarnac, and the producers have really come into their own for producing Cognac of artisanal quality for over four generations. For over two decades, the house have strived to remain in harmony with Mother Nature by refusing the use of any chemical fertilizers. Having now extended the estate from a humble 7 hectares to now 25, they are one of the most admirable of Cognac houses. François Peyrot are certainly setting trends far ahead of many of the more well-known producers. This is an outstanding cognac, especially given the price. One would have to spend several times more to get something comparable from the major brands.